On a trip to Florida, I stumbled across about a dozen of Andrew Vachss’s Burke novels in a used book store. I’d been interested in his work for some time, so I picked one up. I burned through it in a couple days, returned to the store, bought all the rest, and took them back home with me. I’ve been working my way through the stack for years. You see Vachss books aren’t ones you can read one after another. The world he shares is bleak, the characters hard, the situations terrible, gut and heart-wrenching and often uncomfortable. Vachss’s background gives him the ability and experience to write about criminals and victims, abusers and the abused, users and the used with a raw, hard edge and a brutal authenticity that can be difficult to take. And yet there is thread of decency, loyalty, justice, and compassion in the midst of all this darkness. They’re not happy books, Good people are hurt, often long before the novel starts, and they keep on hurting throughout. But justice is usually served on the worst people–although always at a price. On a recent trip, I grabbed my copy of Vachss’s The Getaway Man, a short, stand-alone novel that tells the story of a guy named Eddie who just wants to drive. Vachss follows Eddie from childhood to juvie to crime to prison and out again to more and bigger crime. It’s a classic noir tale, a story of innocence and guilt, of dirty heroes, and squeaky clean villains, of lines crossed, and uncertainty about who should be trusted. Eddie is a likeable character, simple but not stupid, an innocent but not an idiot. Vachss shows the world through his eyes in a way that the astute reader can see more then Eddie sees but never lose sympathy for him. I can never quite say I enjoyed a Vachss novel, but I blazed through this one like I usually do. 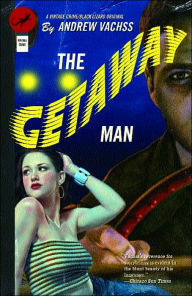 Where the Burke novels have become densely-populated and richly textured with recurring characters and the history that shapes them, The Getaway Man is a stand-alone novel and an excellent entry point for readers new to Vachss and wanting to give him a try. It has its tough-to-read stretches and its share of damaged people just trying to get through their broken lives in one piece, but it’s not as brutal as the Burke novels. If you read it and find yourself wanting more of the same, then you’re probably ready to check out the rest of Vachss’s work. Besides, who could resist the brilliant old-school pulp cover by Richie Fahey.